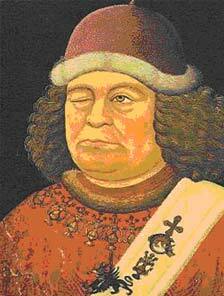 Oenghus: Also known as Aengus. The product of an illicit affair between Dagdha, chief of the Irish gods, and Boann, goddess of the rivers, Oenghus was concerned with affairs of the heart, and is considered the god of fatal love. Four birds always fluttered around his head, thought to represent kisses. He and the faerie maiden Caer lived together as swans after he proved himself and won her hand. After his foster son, Diarmuid Ua Duibhne, was slain by a boar, Oenghus breathed a new soul into the man. A 6?" 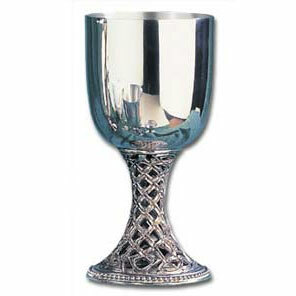 (155mm) high goblet, featuring a unique Celtic open knot-work stem. Oneiza: The beloved of Thalaba the Destroyer, from the 1801 epic poem composed by Robert Southey. Taking its inspiration from Islamic theology and morality, Oneiza is promised to Thalaba, but his duty as a Muslim and God’s champion prevents him from marrying her. While travelling in the garden paradise of Aloadin, he discovers a woman being assaulted – Oneiza, captured by Aloadin the sorcerer. She dies before Thalaba can save her and her spirit follows him thereafter, disapproving and lamenting of his tasks. 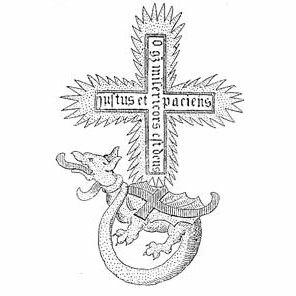 Order of the Dragon, The: A sinister, 15th century elite society founded by Sigismund, King of Hungary and primarily intended for members of the Balkan nobility. All initiates, or Draconists, took the public stance of protecting the innocent. However, their true calling was to ‘crush’ the enemies of Christianity – in particular the Ottoman Turks, under fear that they would expand their empire. In 1408 the foundations were laid for what is known as the Order of the Dragon, taking the legendary dragon-slayer St. George as their patron saint, as well as the red cross and the ouroboros (ancient serpent/dragon) as their symbols. All members were Sigismund’s allies and strongest supporters, required to swear loyalty to the king, queen and all royal endeavours. Vlad Dracul, duke of Wallachia, was eventually inducted in order to protect his domain from the invading Ottoman Empire and gain favour with the Catholic Church. 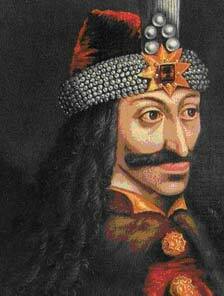 After his death in 1447, his son Vlad Tepesch - better known as Vlad the Impaler – took up the defence of Wallachia. While never a true Draconist, many members of the order saw him as very much his father’s son, christening him as the ‘son of the dragon’; Dracula, in Romanian. Ossa: From the Latin, ‘Os’ and ‘Ossis’; bone, the very soul. Also, the name of the mountain in Thessaly, Greece, or Roman Macedonia, where the Viking Varangian Guards believed their god to live. 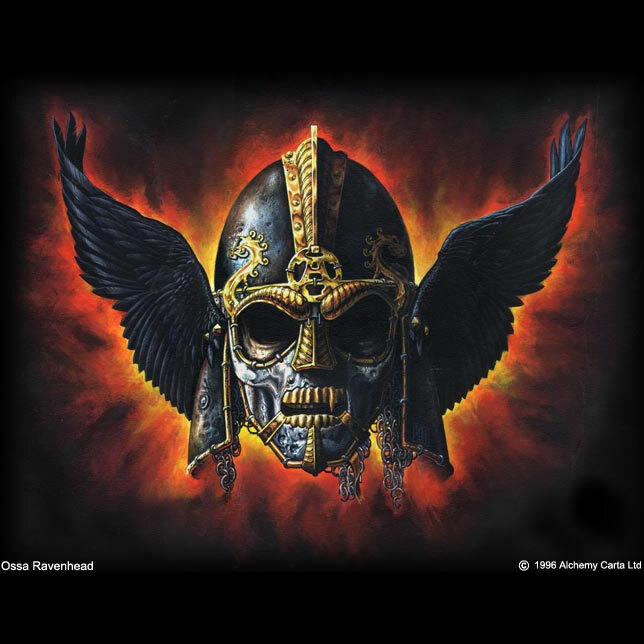 Ossa Ravenhead: Viking cult warrior god of wisdom and strength. Adopted as the principle guiding spirit by many elite Scandinavian explorers and warriors, including the famous Varangians, pioneers of Byzantium and Russia. Ossuary: A large chest or underground chamber in which human bones are kept as part of Jewish and Roman Catholic belief, and often found in areas where burial space is difficult to come by. In some ancient cultures, remains were carried in portable ossuaries under the belief that this would make the dead’s spirit more easily accessible. Pauper's Grave: In former times, peasants and poor common people would consider themselves very lucky to be able to be buried in a rude wooden casket, as most would go straight into the dust or mud of a shallow grave. 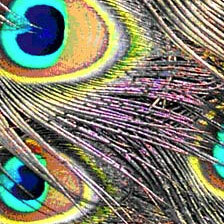 Pavonine: (Latin); bearing resemblance to the vivid colours and exquisite iridescence of a peacock’s plumage.